Nest to Keep: Winner of the Giveaway!!!! 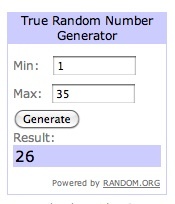 for leaving the winning comment #26!!! AAAA I have never won a giveaway until now! Man am I lucky on this one! It's an American military address but will need a cumstom form since I do live in Korea. Just getting back to you on the fall wreath on my front door. Hey, you can copy and link up to me anytime -I would be privileged if you did! I too am enjoying this Fall weather, I heard nasty rumors the rain is coming in tomorrow though!